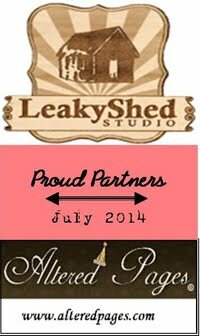 Hello, Juliana here with my first post as a new Design Team Member for Leaky Shed Studio. Today, I have a Christmas Card to share with you that I created using the fabulous Julie Nutting Holly Chipboard Doll. I had so much fun playing with these chipboard dolls! I used acrylic paint for the hair, skin, bracelet, berries and holly leaves. To color her dress, I used one of my favorite markers...a Krylon Gold Leafing Pen. It has a fabulous gold shine and it is so easy to work with on chipboard. I then added some small red jewels for the berries. I love the dimension that the layered chipboard pieces give to the doll! If you enjoyed this card, then please stop by my blog 17turtles.com to see another Christmas Card that I created using the Naughty or Nice Nutting Doll and a fun product called Snow Writer by DecoArt! Juliana this so pretty! Love it! Ohh my, this is sooo lovely, love how you did her dress! This is soooooooooo gorgeous! I love love love the holly belt!!!! Wow I am loving the gold on this dress! gorgeous and elegant.